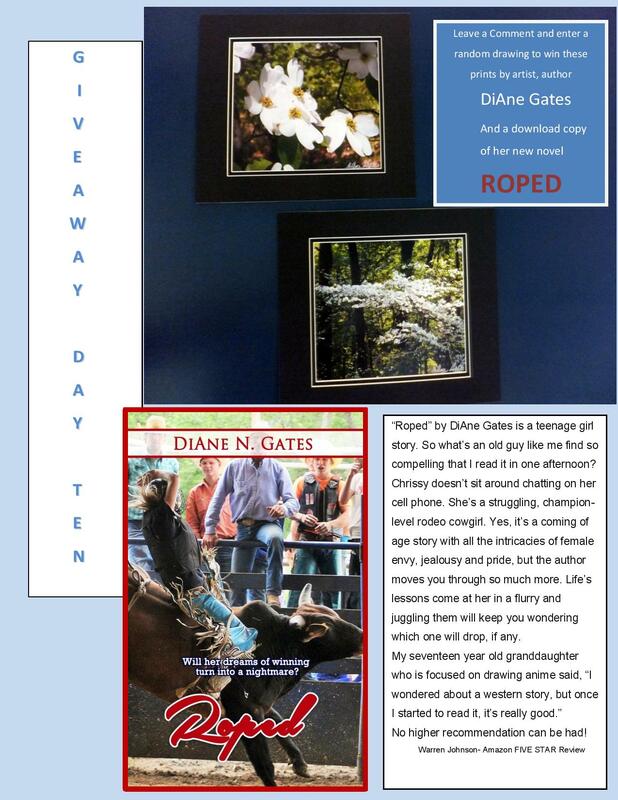 With no further ado, Day 12’s winner in the Give-away celebrating “Roped’s” release is….MARGARET PONTOR!!!!! Congratulations Margaret. I need you to message me your mailing address and your email address so I can mail your purse and send your eBook. I wish everyone of you could have won, and would appreciate your telling friends and family about “Roped”. This has been fun, but book sales are what it’s all about. Sales and reviews. 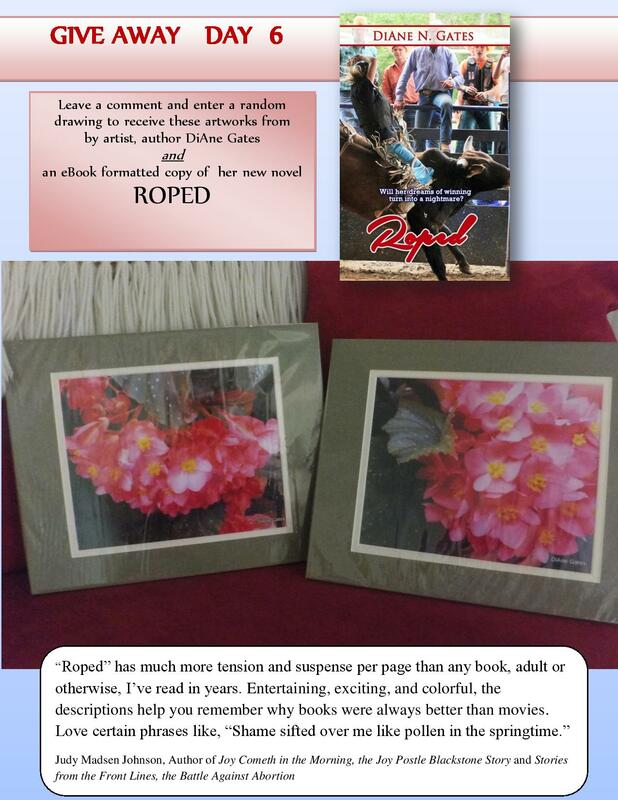 I thank those of you who’ve read and reviewed “Roped” and hope the rest of you will pick up a copy and give a review. This is the last day, DAY 12’s Give-away celebrating the release by Prism Books of “Roped”. If you haven’t gotten a copy I sure hope you will. Available on Amazon.com or Barnesandnoble.com. My heartfelt thank yous to every one of you who participated in this celebration, who’ve already posted a review and those who are still reading before posting. I appreciate each one of you who’ve shared in the promotion. ❤ and hugs! 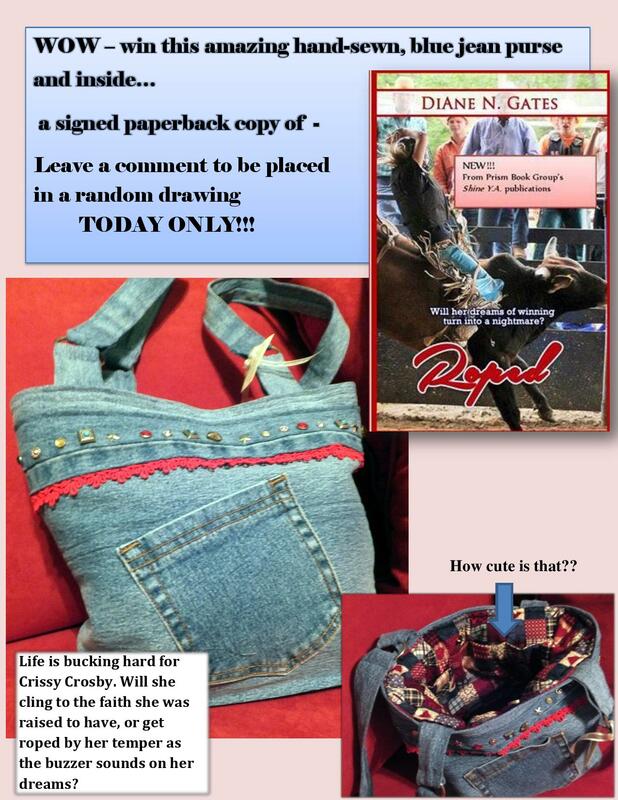 The winner for Day 11…the blue denim purse and eBook of Roped is….is JOYCE GRAVES!!!! YAY, JOYCE!!! I need your street address and your email address to send your goodies. The books are due in by Wednesday. I’ll mail your give-away as soon as the books arrive. Congrats! AND NOW….THE BEGINNING OF THE END…of the release give-aways for “ROPED”. 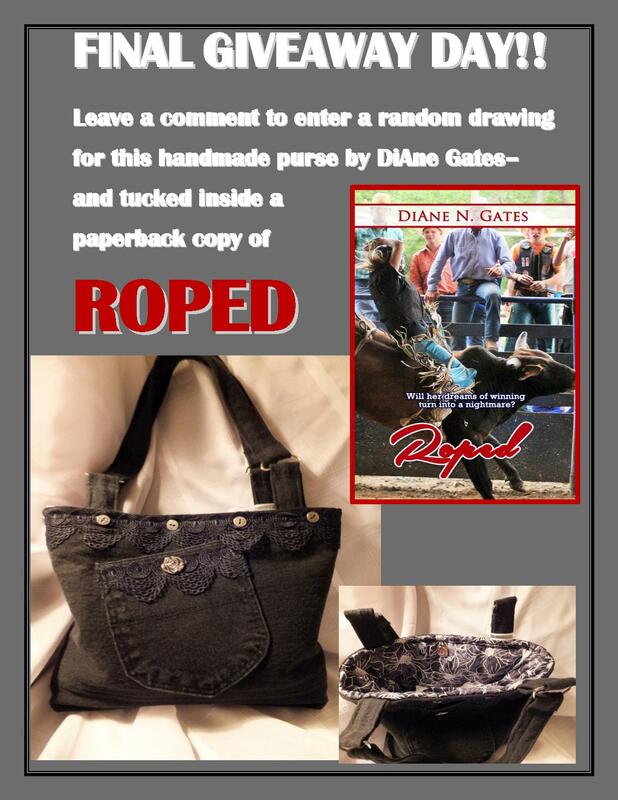 DAY 11’S prize is an original, one-of-a-kind denim purse designed by PURSE PIZZAZZ and a signed copy of “Roped”. Twenty-four hours from now we will announce the winner and post Day 12’s prize. It’s not to late to register…remember a comment about Roped or the prizes will put your name in the middle of the heap! Hope you win! We have two give-away winners tonight. First Day 9 is reawarded to MARY SEFZIK AND Day 10 is awarded to LINDA SHEW WOLF. 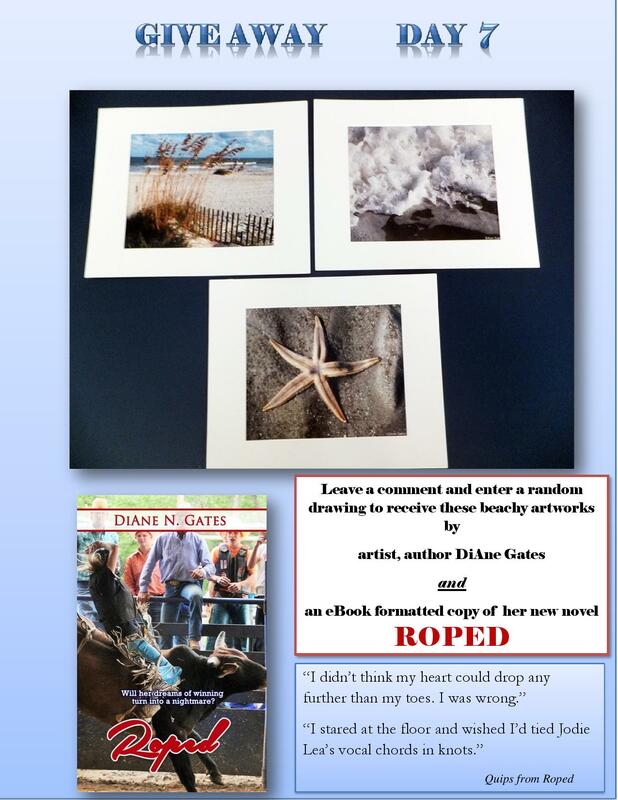 Ladies, please message me your street address as well as your email so I can send your matted photos and your eBook of Roped. Sure would appreciate your reviews! Need to hear from Donkey Driver. Jane, you won Day 9’s Give-away. We need to hear from you by tonight, Saturday, at 9 p.m. else we will have a double drawing. WooHoo! It’s Day 10 Give-away! Tomorrow evening at 9 p.m. we begin the final cheers for Roped’s release, a week ago today. I love flowers, I love the beach, and I love springtime in Texas and dogwoods! Tomorrow’s give-away is a pair of dogwoods in blossom at Tyler State Park, just outside Tyler Texas. That’s where we kayak and picnic. We’ve had almost eighty folks register for the drawings . I hope you win tomorrow evening! And stay tuned for the Sunday and Monday final drawings…there will be very special prizes to end this celebration. I’ve grown accustomed to our meeting time of 9 p.m. each night. A time to congratulate Day 9’s give-away winner! Only three more nights of prizes to go. And tonight’s winner of the beach photo trio is…….DONKEY DRIVER JANE. Jane, I know you by no other name. 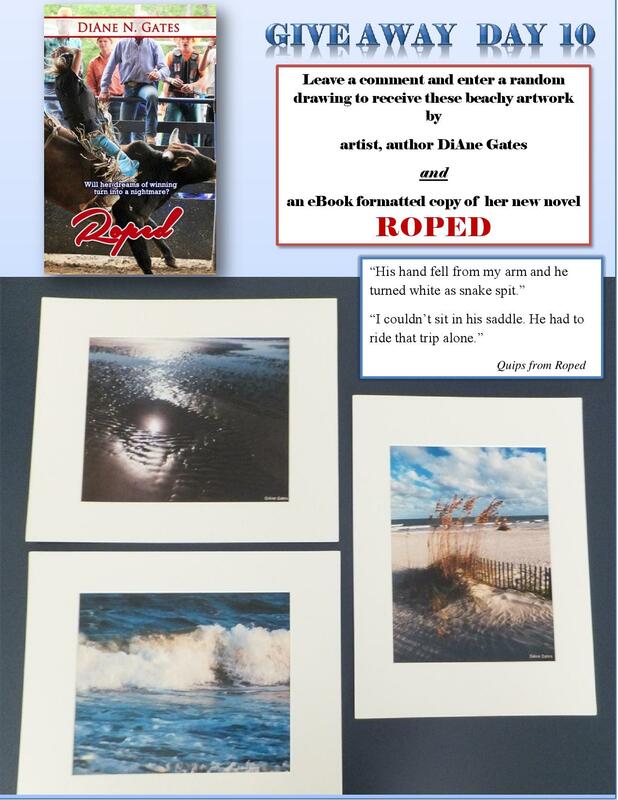 So you need to message me with your street address as well as your email address so I can send your photos and your eBook of “Roped.” Congrats and I hope you enjoy the book and if you have time, please post a review on Amazon and Barnes and Noble. 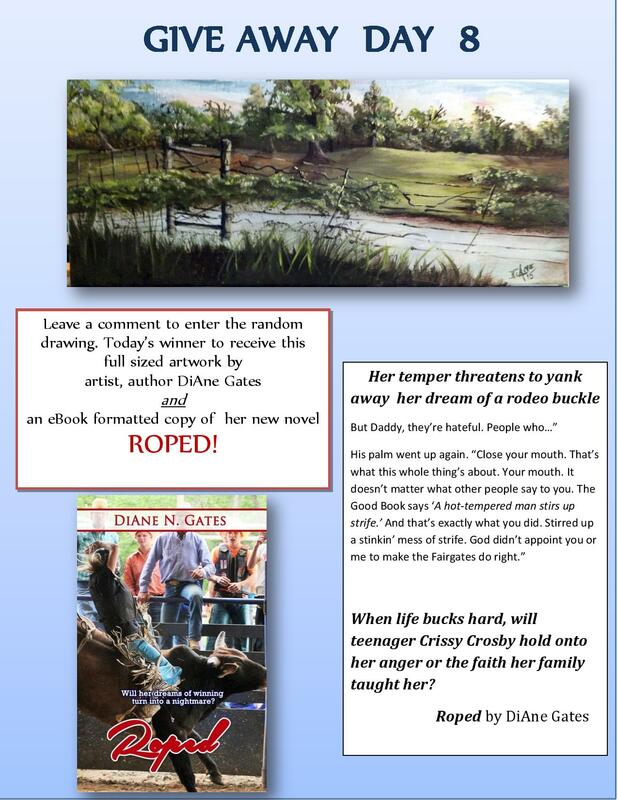 Just a reminder…four hours left ’til we know the winner of Day 9’s give-away for Roped’s release. The clock is ticking. Hurry! It’s 9 p.m. and time to announce the winner of Day 8’s give-away…and the name is Katharine Trauger. Congratulations, Katharine. Please message me your street address and your email so I can send your eBook of Roped. Four more days of prizes..don’t be left out folks. A little over four hours left ’til Day 8’s drawing. Get your comment in. After tonight four prizes are left in the celebration. Hope you’ll be part of our fun! “You seen my dawgs, girl?” Ed Fairgate’s eyes narrowed into slits, a grisly looking man whose presence dwarfed everyone around him. I inched backward, choking on the stench of his breath. “What’s the matter—cat yank a knot in your tongue? Speak up.” He leaned toward me and his face colored as scarlet as his frizzy red hair. Prejudice, anger, and dark secrets simmer in a pot of family feuds destined to boil over in a tragic nightmare at the rodeo. AND NOW FOR DAY 8’s GIVE-AWAY REVEAL!!!! Y’all have 24 hours to register if you haven’t already done so. After tomorrow night’s drawing, we have four more drawings and give-aways. Don’t miss the opportunity to be part of this celebration of “Roped’s” release. And please don’t forget to post a review when you read the book. Your opinion matters! TA DAAA! AND THE WINNER FOR DAY 7 IS……MARJORIE HILL!!!!! Marjorie, I need you to message me your street address as well as your email address so I can send the eBook of Roped. Congratulations! Hope you enjoy. And if you have a moment, please post a review on Amazon.com and Barnes and Noble.com. Nine hours and counting…drawing at 9 p.m. tonight! Don’t forget to register…leave a comment on my websites about Roped or the give-aways! FROM THE GARDEN TO THE SEA SHORE…DAY 7’s GIVE-WAY PHOTOS WERE TAKEN AT HILTON HEAD…ALONG THE CAROLINA SEA SHORE. LOVE THAT LOW COUNTRY COOKING! Y’all know what to do. Those of you who have registered, you still have six more opportunities to win. But to those who haven’t joined the party yet, I invite you not to wait another moment. Simply send me a comment about Roped or about the give-aways, and I’ll add your name to the pile. Drawing for Day 7 will take place at 9 p.m. Wednesday night. See you there…hope you win! WooHoo! It’s 9 p.m. and time to announce the winner of Day 6’s give-away…and the winner is...TAMMY MOSLEY!!!!! Tammy, please message me your address and your email so I can send the begonia prints to your house to live and send you an eBook of Roped! Congratulations! Five more hours and the Day 6 give-away will have been awarded. Don’t miss your opportunity to win! Only six more prize days remain after tonight’s drawing. Don’t miss being a part of our celebration. Can you believe we’re already at Day 6 of the fabulous give-aways celebrating the release of Roped? Here’s my gift to y’all tonight for tomorrow’s prize. Remember all you have to do is send me a comment about Roped or the give-away to win. We’re half-way there and the best is yet to come!